BUYING! X Checkout $25.00Buy Now! Cloud Chamber by Rhythmic Robot is Soundware (e.g. samples or presets that load into other products). Requires a full version of Native Instruments Kontakt version 4.2.3 or later (all versions of Kontakt 5 are supported). Kontakt Player is NOT recommended and will time out after 15 mins or so. PLEASE MAKE SURE YOU HAVE A FULL VERSION OF NI KONTAKT AS WE CANNOT GIVE REFUNDS FOR SOFTWARE BOUGHT IN ERROR. 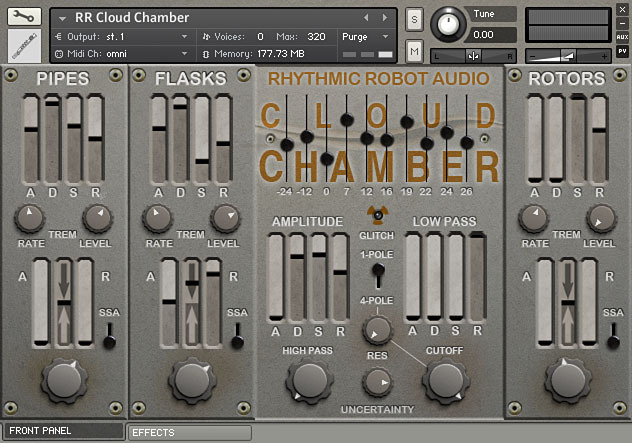 Cloud Chamber from Rhythmic Robot is a hybrid synthesiser based around samples of three kinds of acoustic wind instruments, wired to a "Sine Bank" of 8-bit sine waves pitched to the harmonic series. The acoustic samples include Pipes (clean penny-whistle type tones with a small attack chiff), Flasks (blown bottle tones with a pronounced overblow in the attack) and Rotors (wind-wand "bullroarer" tones with a slow ramp-up attack and pronounced periodic tremolo). 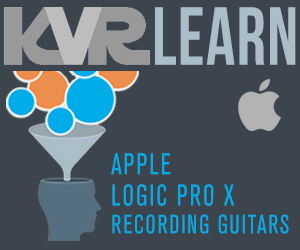 These can be played with their characterful attack portions switched in or out; with the attack removed, the sounds lend themselves to more abstract sound design, or can be grafted onto synthetic attacks created with the Sine Bank. Cloud Chamber excels at creating strange, ethereal tones and textures with the sonic fingerprint of acoustic sources; "unreal" instruments that nevertheless sound like they should be real; and complex, varying, evolving soundscapes that conjure up steampunk-style futures, windy mountain peaks, industrial piston chambers, sussurating cave mouths, and a thousand other uniquely characterful locations. Whether you want a hissing pad from the Victorian steam age for an electronic track or a convincing Troll flute hewn from a solid tree-trunk for your soundtrack, Cloud Chamber can dial it up for you. It includes a Glitch control which randomises the controls in a musically intelligent manner for instant inspiration, and a factory patch library of 30 starting points for your sonic adventures. Cloud Chamber is available now, costs £13.45 (special introductory offer; normal price £14.95) and requires Kontakt version 4.2.3 or later (including all versions of Kontakt 5).